Will there be any fish in our future? As wild stocks become depleted and aquafarms reveal their limitations, our award winners are helping to make seafood sustainable. Former bank director Orri Vigfússon of the North Atlantic Salmon Fund (photographed, right) has almost single-handedly decreased salmon fishing in the Atlantic by 75 percent: He pays fishermen not to fish. Since Vigfússon created the fund in 1989, it has raised and given out roughly $40 million to fishermen who stop catching Atlantic salmon, which are dramatically overfished. Additionally, the NASF helps these fishermen find new jobs. 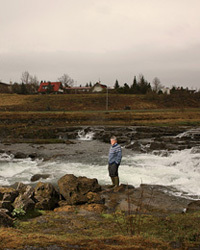 “Billions of dollars were being spent studying the problem, but we made commercial deals that rescued salmon for a fraction of the cost,” says Vigfússon (nasfonline.org). Tim O’Shea and Dale Sims of CleanFish have figured out an ingenious way to aid tiny, eco-minded fisheries by helping them sell their seafood to prestigious restaurants and retailers. CleanFish, founded in 2004, looks for excellent small aquafarms and wild fisheries, such as Loch Duart in Scourie, Scotland, which lets its sites sit fallow one out of every three years, allowing them to regenerate through tides and currents before being farmed again. CleanFish brought its salmon to the attention of chef Thomas Keller of Napa Valley’s French Laundry, who loved it. Today, Loch Duart salmon is the only kind served at the French Laundry. CleanFish, which currently works with around two dozen aquafarms and wild fisheries, has become a valued resource for all kinds of environmental groups. “Folks from the David & Lucile Packard Foundation recently called us and said they know shrimpers in Mexico’s Sea of Cortez who want to become more sustainable but are afraid they won’t find customers who’ll care,” says O’Shea. Thanks to CleanFish, those shrimpers now sell their Fisherman’s Daughter brand of sustainable shrimp to restaurants like Akasha in Culver City, California (cleanfish.com). Mark Powell, vice president of fish conservation for the nonprofit Ocean Conservancy advocacy group, has made sweeping changes to help restore the Gulf of Mexico red snapper population by lobbying government groups and partnering with some of America’s most powerful fish buyers. Because of generations of overfishing, the snapper population has dwindled to three percent of what it was 125 years ago. Last year, Ocean Conservancy successfully pushed the Gulf of Mexico Fishery Management Council to limit by about half the number of red snapper that commercial fishermen can catch, and advised shrimpers to reduce accidental bycatch of snapper by about three-quarters. To aid the cause, Ocean Conservancy met with mammoth retailer Wal-Mart and its shrimp suppliers and urged for the reduction of snapper bycatch (Wal-Mart has pledged to sell only Marine Stewardship Council–certified fish by 2011). Powell is also working with Bob Sullivan, the corporate CEO of the Chicago-based Plitt Company, which supplies fish to Whole Foods Markets and top local restaurants. In turn, Sullivan pressured government agencies for stricter snapper quotas. Because of efforts like these, Powell says, “In the future, everyone eating Gulf Coast red snapper will be eating sustainable Gulf Coast red snapper” (oceanconservancy.org). Oceana, the ocean-restoration group, aims to protect fish by lobbying to end government subsidies given out worldwide to fishermen each year. “Governments are paying fishermen to overfish,” says Oceana senior campaign director Courtney Sakai. “Much of the $30 billion in subsidies increases fishing capacity—the ability to fish longer, harder and farther away. It has helped produce a worldwide fishing fleet that’s up to 250 percent larger than what is required to fish at sustainable levels.” She also notes that some harmful practices, like bottom trawling, wouldn’t be profitable without huge subsidies. Established in 2001 by several foundations, most notably the Pew Charitable Trusts, Oceana counts longtime ocean conservationist and Cheers star Ted Danson as one of its most active board members (the nonprofit he co-founded, American Oceans Campaign, was folded into Oceana in 2002). As a formal advisor to the government on trade and environmental policy, Oceana pushed for two resolutions in 2007 that supported the elimination of subsidies; both were passed by Congress. Next up: lobbying foreign delegates to the World Trade Organization to end fishing subsidies in 152 countries, particularly Japan, India and China (oceana.org).